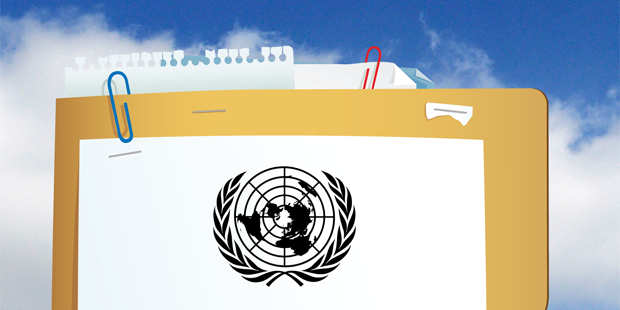 The United Nations is the main international organization responsible for promoting world peace. It has played a vital role in preventing the use of nuclear weapons, yet few people really understand how it works. How much do you know? This activity requires you to represent the views of a particular country. There are currently 193 UN members – almost every nation in the world – and each has one vote in the main body within the United Nations, known as the General Assembly. The very first resolution of the General Assembly called for the complete abolition of nuclear weapons. Another major body is the Security Council, which meets at any time to debate matters of international security. Its decisions, unlike the decisions of the General Assembly, are enforceable. This activity will teach you the fine art of diplomacy. You will learn about how the United Nations operates and how different countries perceive the nuclear threat. Decide which countries should participate in the debate. Allocate each participant a country to represent. The President should open proceedings and invite any nation to propose a resolution. A delegate should introduce a resolution and read it aloud to the General Assembly. The President should then invite a delegate from another country to second the proposal. All delegates should notify the President if they wish to speak for or against it. The secretary should produce a list of speakers, alternating between “for” and “against”. The first speaker should be from the delegation that proposed the resolution. The timekeeper should ring a bell after a certain time for each speaker, e.g. three minutes. At any stage, a delegation can introduce an amendment to the resolution. Any amendment should be debated and voted upon. The resolution itself should also be voted upon – you can say “for”, “against” or “abstain”. The resolution succeeds if there are more countries voting “for” than “against”. It is customary to applaud if a resolution succeeds but not if it fails. The President should close proceedings or invite another resolution. Delegates should represent the views of their particular country. If you don’t know much about the policies of the country you’re required to represent, do some research. Find out whether it supports the elimination of nuclear weapons and measures to prevent nuclear proliferation. A useful website is www.reachingcriticalwill.org, which publishes nuclear disarmament speeches made at the United Nations. Decides to include in the provisional agenda of its next session the item entitled “Follow-up to the Advisory Opinion of the International Court of Justice on the Legality of the Threat or Use of Nuclear Weapons”.